Make the highlight of your Memorial Weekend this fun-filled day of racing, camaraderie, music, and summer-inspired food with your fellow club members. The Open House Regatta and Party is the one event for every part of the club. We've got Offshore, One Design, Junior, Cruising, and Social divisions all coming together for an easy race, a raft-up, and dinner with a band. Our members are encouraged to invite all of their friends on their boats and to the club for the festivities. The day starts with a staggered start race for all boats around a set of government marks, finishing in the early afternoon just off the FBYC pier. 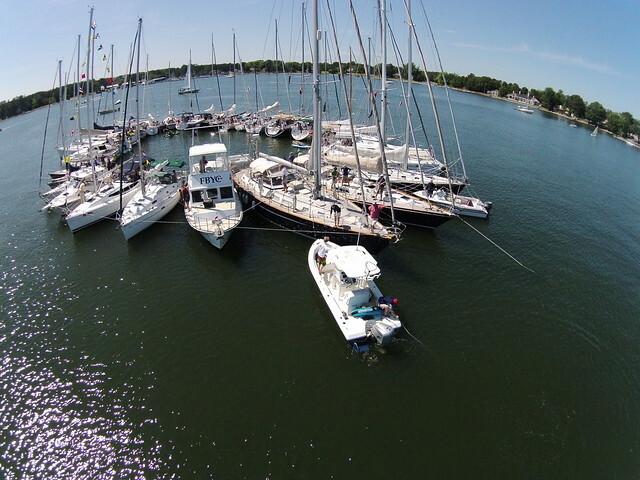 Then all of the boats are encouraged to raft up, and we'll shuttle folks from the FBYC dock to the boats. To end the evening, there will be dinner and a band. The 2016 Raft Up Marshal is Waddy Garrett! He will be graciously directing the formation of the raft up. Contact him on Channel 71 and state your intentions. Dinner is a full fledged pig pickin'. That means it's pulled right there with other options available! 1800 - 2200: Live Entertainment. 1300: After finishing, please join the raft up! Radio your intention on channel 71 to the raft up marshall.